The Chaise Longue, the French language name to describe a chair deemed long enough to support the legs of the recliner, a daybed, furniture meant for relaxation. It comes as no surprise to learn that the history of the Chaise Longue goes a lot further back than medieval Europe with references of them being made in ancient Egypt! Charles Eames was no stranger to the comfortable chair, after all he certainly produced one or two. One of his earliest works in the 40’s was a hand molded Eames Chaise Longue, made from fiberglass which wouldn’t even hit the market until the 90’s, long after his passing. 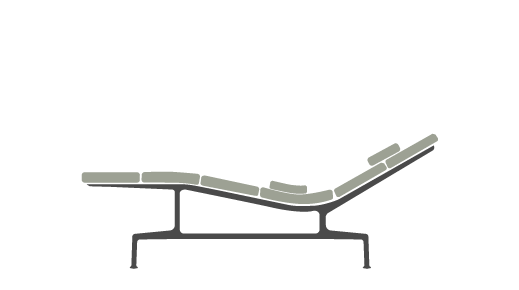 In between was the only marketed Chaise he produced in his life time, a beautifully characteristic and functional daybed as unique as it was stylish. The International Competition for Low Cost Furniture held during 1948 in New York by the Museum of Modern Art would be the motivation and inspiration for Charles Eames’ first Chaise Longue. Delving into his earlier 1940’s ‘Organic furniture’ roots, Charles set about producing something quite different, visually stunning and indeed startling, especially considering the post war period. In fact, the competition set parameters for the entries to be of low value and with a generally small overall footprint and for this reason Charles never expected to win with this design only to showcase his talents. It did however get a special mention from the judges and Charles did win prizes for his Molded side and arm chair range, the pre-cursor to the fiberglass range. This creation was to be called the ‘La Chaise’ which didn’t come from the obvious fact that it was a Chaise Longue but a mere co-incidence that occurred by name. 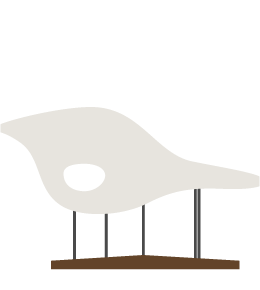 It came from the inspiration for the design itself, the ‘Floating Figure’ a sculpture designed by the artist Gaston Lachaise. Made of two pieces of hand molded fiberglass, the design was initially penciled in for a market release in 1950. The reality however was that it was deemed too expensive, too time consuming and too luxurious a piece to be making and selling during the post war years when value and mass production were key. It wouldn’t be until 1991 that the European licensee Vitra would make a version for the market. Their initial fiberglass versions that were sympathetic to the original design would be replaced with cheaper polyurethane in 2001. We had to wait until 1968 for the next Eames Chaise Longue, the model ES-106 which also developed the name of the ‘Billy Wilder Chaise’ after its production. The Wilder connection came via a visit by Charles and Ray to the actor during the mid-1950’s. After seeing Wilder suspended on a plank of wood and after he remarked on his need for a daybed, Charles promised to produce the very thing, though it took at least 13 years to do so. This favorite fable of Charles was never entirely verified but the result was an Eames Chaise Longue Design of real comfort and beauty. Released at the same time as the Soft Pad Chair series, the link is clear with its use of a line of thick padded cushions. The Eames Chaise Longue designs from Charles and Ray were only two in number, designed 20 years and released 31 years apart but both were well worth the wait.